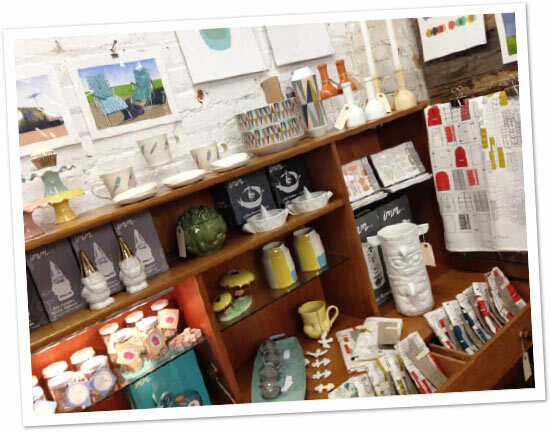 I opened the Finely Crafted boutique in October 2012 inside midtown Atlanta’s Paris on Ponce design market. I saw it as an opportunity to leap from the sidelines as “handmade cheerleader” and join the game as a “handmade curator.” The shop is now an online-only destination for home decor, personal accessories, and gifts that salute modernism and midcentury kitsch. Naturally, I favor small companies and individuals who pour their hearts into their creations, many of which are made by hand. I also work with artists in different media to create unique, limited-edition products. So far I’ve collaborated with illustrators Leah Duncan and Paper Parasol Press, jeweler Is Was & Will Be, screen printer Laure Designs, and laser-cut wood specialist Havok Designs. 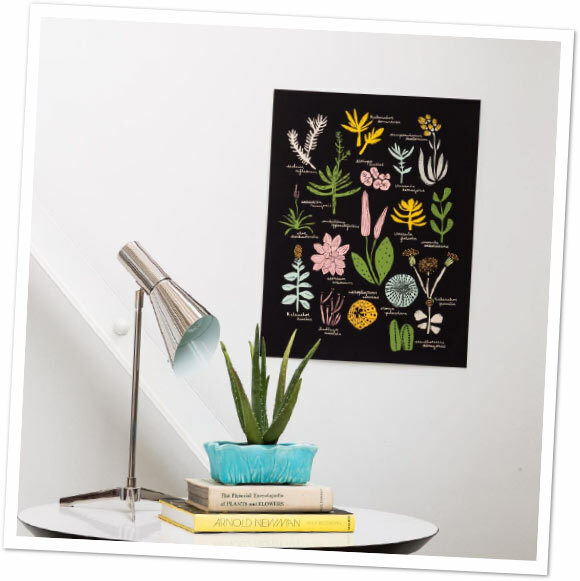 Artist Leah Duncan and I co-designed a striking succulent series in a limited edition of 200. We set out to contrast her playful drawing style and signature pastels with a serious genre–scientific botanical illustrations. Our result is way more fun and mod than scientific (but the Latin names in Leah’s handwriting are correct, I checked)! We collaborated by e-mail for a few months, then finally met in Brooklyn to approve and print the final designs. I collaborated with Telle Lefler of Is Was & Will Be to create a tribal-modern jewelry series, exclusive to Finely Crafted. 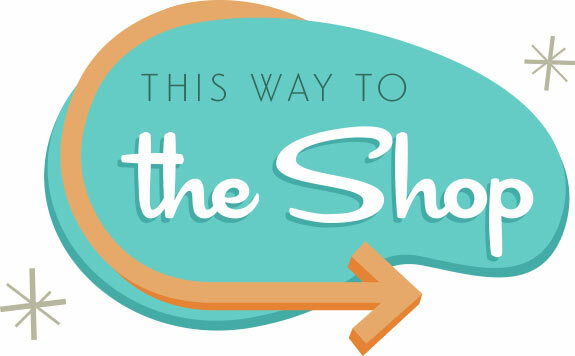 We worked by e-mail for three months, exchanging hundreds of messages about bead colors and gemstones! 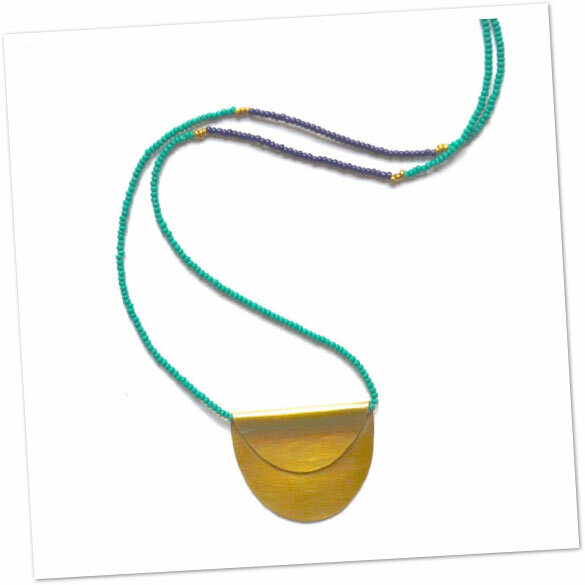 The collection features hand-formed brass centerpieces, glass seed beads, and recycled vinyl. 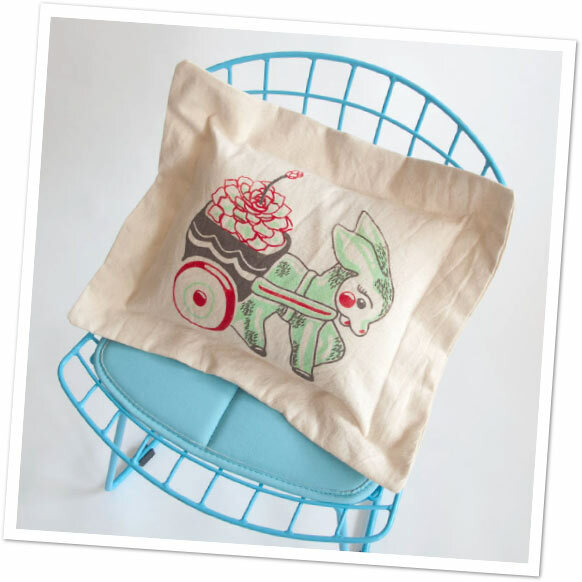 Printmaker Laura Cherry of Laure Designs and I co-designed this adorable pillow together as part of the Eensie Figurine series. We started with a Pinterest page of our favorite vintage animal planters. At several meetings over bubble tea and many e-mails, we adapted the designs for screen printing and agreed on a 50s-inspired color palette. I visited her Suwanee, Georgia, home studio to watch her make the first prints and sew the pillows using eco-friendly materials. 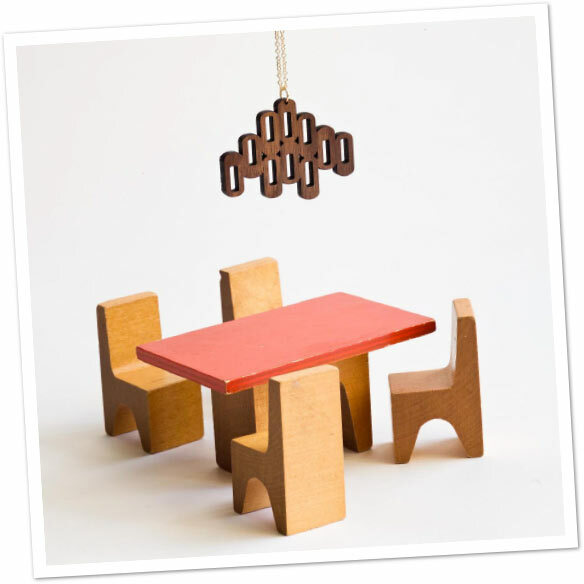 This laser-cut walnut necklace salutes a chandelier Audrey Hepburn may have dangled over her dining table. It’s from the Paradise Heights collection, a collaboration with Kristen Shearon of Havok Designs. Paradise Heights is an imaginary neighborhood of modern homes where celebrities, TV characters, and regular folks alike sleep on platform beds below butterfly roofs. 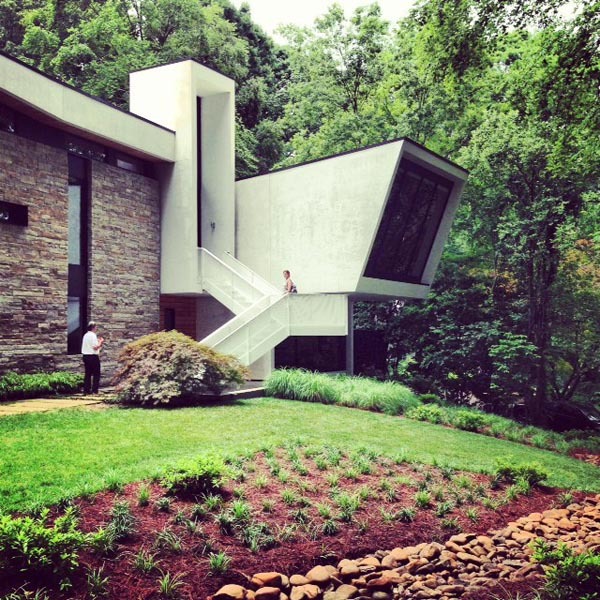 On any given Saturday, you might see them grilling in their outdoor kitchens or polishing their chrome mailboxes. 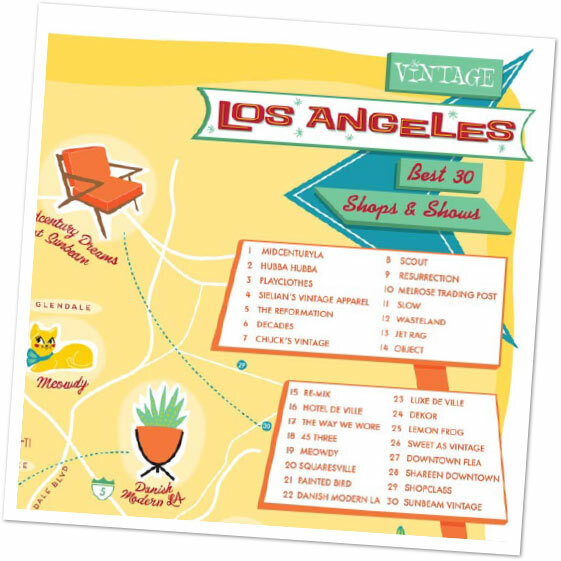 I collaborated with Cindy Tomczyk of Paper Parasol Press to design this art print that maps my favorite 30 vintage shops and other retro hot spots in Los Angeles. I did the research and art direction, and Cindy brought my ideas to life with cheerful, midcentury-style illustrations. 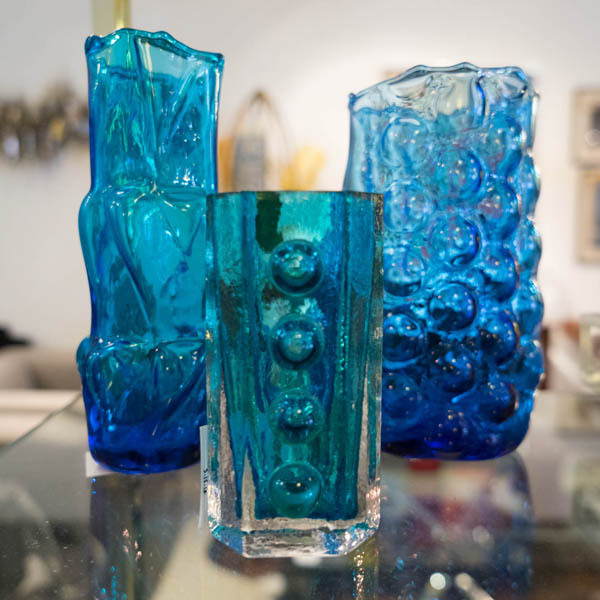 My boutique and show selections run the gamut in their offerings, from cat-eye glasses to Danish modern furniture. We made a map for Atlanta, too.